Yanni, thank you for taking the time to answer my questions. Going back to Gonzaga next week and will play with the corvina. Tight lines. Thanks Bob, for trusting me with your belly!! Q1: Mild Mexican spices for delicate fish? Bob, Zafron, and Turmeric are used in Mexican cuisine a lot. Not so much for their flavor, especially since they are not strong, but for their color. Both add a brilliant yellowish orange to your fish and are packed with health benefits. Favorite Recipes for mild fish? Create a dry rub using one part salt, one part pepper, and one part 50-50 zafron/turmeric. Rub your fish, then grill it. Squeeze lemon before eating. then flip the fillet over and only cook it for half the time the first side took. Cooking the fillet for equal times on both side is a big mistake. Cooking is trial and error. Don't be afraid to screw up, once or twice. But learn as you go. Q3: Sierras? Love fighting them on light tackle, love eating them too. Sierras are mild flakey fish. They make a great ceviche, or baked and/or fried with bread crumbs (to lock in the juices). Congrats on figuring out Bonito are great!! Q: Bonito, can I cook them in unusual ways? Mark your timing is perfect. I'm spending my Sunday putting the final touches on my new video-recipe: Bonito Parmesan. Fresh bread crumb covered bonito, homemade red wine tomato sauce and parmesan cheese. Unusual? Let's say, this is News to the Italians! Thanks Yanni, I can't wait for the Bonito Parmesan recipe. Sound super yummy! This is my go to sticky. 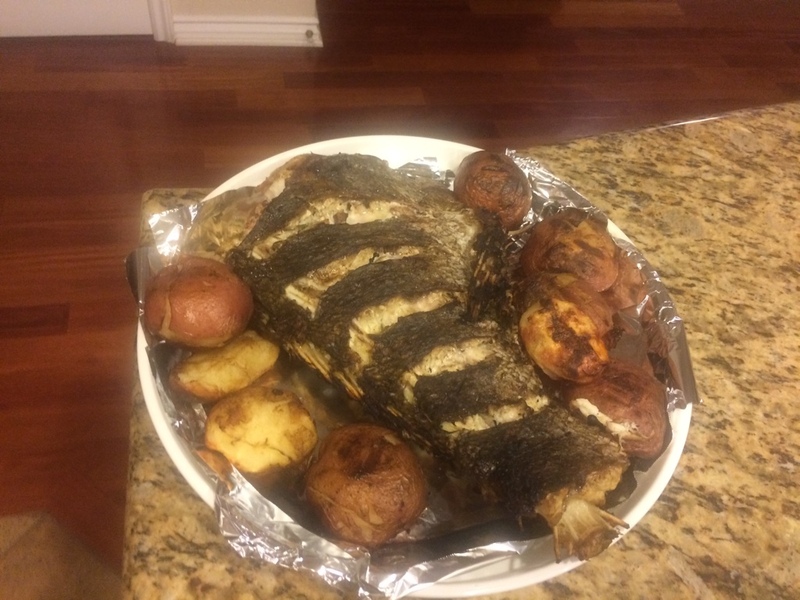 I have tried pan roasted rockfish and everyone loved it. It is my kids favorite dish now.. Cast Iron skillet - all the way! I would also like to know if you have any recepies for salt cured fish? Last edited by Valek; 09-27-2015 at 11:27 PM. Thanks for Dinner and breakfast inspiration!! Last night dinners was a family affair with the kiddos helping cut, rub and cook..
That looks better than mine!!!! No kidding!! Boston started Dunkin Donuts. That's a fact. White seabass...fried egg, onions and avocado taco for breakfast? I'd eat it! Dude! I'm no knife expert but I do know this, there's a different knife for different jobs. Q: Which knife? Really, you need these three, boning, breaking and chef's. Of the three two are must haves for fisherman, the breaking knife and chef's knife. The breaking knife is similar to the boning knife since it's narrow and allows you to follow bones while filleting. But in addition the breaking knife has a curved end which gives you leverage to easily break small bones. And, the curved breaking knife makes easy work of skinning fish. The chef's knife is the universal cooking knife. Chopping, cutting and even skinning fishing is possible with a chef's knife. And as your confidence grows in the kitchen your dependence of the chef's knife will grow as well. Right on! Thanks for the reply and info on knife options. I've been using the same rapala fillet knife for a decade + a solid sharpening stone and I think its time to upgrade. Second question, I really liked the CA style, yellowtail gravlaxs idea and thought "what other recipes or ideas do you have for salt cured fish? What is your favorite ceviche recipe, and with which fish do you prefer to make it? Yellow Tail, Bonita, and Salmon all make great Gravlax. What about Sierra Mackerel, Tuna or even Wahoo? Any others you might suggest trying? Tony, just got back from paradise. Breakfast this morning, almost as good. Grilled Orange Mouth Corvina, eggs, onions, sliced avocado, AND home made flour tortillas with fresh salsa. Yum, Yum, Oh so good eating breakfast on the beach, watching the sun rise over Punta Bufeo. Need to get YOU back down. Also need to get down YANNI there. Venezuela and Peru (where ceviche was invented). Peruvian are crazy about their ceviche. It's as common there as hot dogs are for us. a rice flavoring, to sauces for meats or fish. But especially for Peruvian ceviche. Actually, this sounds like a great vid-recipe for FishermansBelly. Sierra. Here's why, wahoo fillets are thicker and would slice/present better than the much thinner fillets of Sierra. Last edited by kayakfisherman; 10-04-2015 at 09:13 AM. Lobster is on my list of things to CATCH AND EAT! Yani. I enjoy your channel cause you use the entire fish and sometimes bait! I've always wondered if anyone eats the fresh caught bait when no big fish comes home. So along those lines.. . I'm trying to use all i can of a lobster. Most agree the tail is what it's about. I wanted to share my process. 1) Rip off tail dry, vacuum seal and freeze for another time. 2) take the carapace and halve. Clean out the tamale and the guts under running water. Pull legs from the carapace and use the knife to scrape off the feathery gills. 3) put cleaned halved carapace and leg bunches into water with celery and onion. salt and pepper to taste. 4) cook slowly about 20 min (i use a pressure cooker on low). Remove the halved carapace and legs. Let the lobster and broth cool. pull out the head, leg and antennae meat. Put it in bowl. Strain the lobster broth. I freeze the broth until I'm ready for some lobster bisque. The head, leg and antennae meat is a great addition to a bisque, salad topping, or a lobster roll! Freeze you can freeze it too. OR think lobster-dogs. (my wife ate the other before it was photo'd). then have fun cooking 'em! Last edited by kayakfisherman; 10-07-2015 at 08:42 PM. That "lobster dog" you're showing is (one of) what they call a lobster roll back east. Kudos for the mayo-toasting. Anyone mind sharing where the head meat is on lobsters? I know the legs and antennae. And quick tip if anyone didn't already know, damp paper towel around a bundle of legs and into the microwave they go. Most of the time they pop right now. didn't care for it any suggestions?